Look at the transformation in these graphs from jagged noise (storms) to periods of calm. The Younger Dryas (YD) was the cold period that lasted from 15,000 years ago til about 11,000 years ago in Greenland. It looks like a phase change, it’s so sharp. Figure 1. The GISP2 ice core record. (a) Original calcium (p.p.b.) and sodium (p.p.b.) data plotted as age (years ago with AD 2000 as 0). (b) Dots mark original 10-cm resolution sample midpoint. Rectangle marks the location of the ice section discussed in this paper (1677.575–1678.580m depth (11 643–11 675 GISP2 a BP)) bridging the Younger Drays (YD)/Holocene transition. This figure is available in colour online at wileyonlinelibrary.com. In this study (2–20-mm resolution) changes in calcium and sodium atmospheric circulation proxies preceded changes in snow accumulation, followed by a change in temperature using stable water isotopes. A second example of the advantage gained by high-resolution sampling is the demonstration, based on continuous melt sampling techniques (2.5–5.0-cm resolution), that the onset of Holocene climate occurred over 1–3 years and that the abrupt shift in atmospheric circulation at this transition preceded a change in temperature (Steffensen et al., 2008). Here, we use previously developed ice core climate proxies, expand upon the concept of finer scale sampling of calcium and sodium with the addition of iron, and focus on the abrupt climate change precursor – a change in atmospheric circulation. I think I find this study most interesting because of the sheer detail, and the transformation that appears to take place so quickly. Can we really tell what direction the winds over Greenland came from in the summer of 9,651 BC (or whatever year close to that it turns out to be?) But I also find myself wondering what life would have been like if ice ages were also full of ghastly storms. How did people cope?Here’s some more of that detail — the numbers on the graph are in meters of depth, not years, but this apparently translates to 11,643–11,675 years BP. Figure 3. Detailed examination using the smoothed laser sampled record from Fig. 2. Detailed 5-cm-long sections for calcium, sodium and iron (all in p.p.b.) in red, blue and green, respectively, plotted as smoothed data (10-point running median). (a) Holocene (1677.75–1677.80m depth) and (b) YD and YD/Holocene transition (1678.17–1678.23m depth). Gray rectangles mark the location of chemistry peaks used to identify annual layers. Black vertical lines (1678.18–1678.19m depth) mark the YD/Holocene abrupt climate transition year. This figure is available in colour online at wileyonlinelibrary.com. Previous work demonstrates that peaks in calcium and sodium occur during winter/spring, consistent with increased atmospheric storminess and increased transport of terrestrial dusts and seasalt to Greenland at this time (Whitlow et al., 1992). Therefore, lower background concentrations of calcium and sodium over Greenland indicate less stormy periods, as expected during summer. Annual layering (gray rectangles Figs 2 and 3) is well preserved and defined by inphase seasonal maxima in calcium, sodium and iron. Figure 3 (only smoothed data are shown) details two 5-cm core sections noted in Fig. 2. It all occurred in just one year? Closer examination of Fig. 3(b) shows that the YD/ Holocene transition is defined at the depth over which levels of calcium, sodium and iron decline markedly (1678.18– 1678.19 m). This depth range spans approximately 1 year and includes a significantly reduced winter/spring peak in westerly winds (calcium) compared with the previous 3 years (1678.19–1678.22 m). During the 3 years leading up to the transition, westerly wind peak values rise progressively. Westerly winds then weaken to Holocene (Fig. 3a) values at the transition. Marine storm intrusions (sodium) are variable in the 3 years before the YD/Holocene transition as westerly winds strengthen, potentially blocking transport of marine air onto Greenland. However, marine air mass intrusion is greatest during the transition year, suggesting intensified circulation over marine areas and closer proximity of marine air to Greenland as sea ice extent is reduced and westerly wind strength declines. Marine air mass incursions are less intense following the transition into the Holocene, as evidenced by lesser concentration peaks in sodium and longer periods of less intense transport (near flat sodium concentrations) during the longer summer seasons characterizing the onset of the Holocene. Iron concentrations drop at the beginning of the transition year and early Holocene (1678.18m and shallower depth) iron transport to Greenland is characterized by longer periods of weak transport from continental sources. Reduction in continental source calcium and iron and marine source sodium is consistent with northward migration and weakening of the westerlies and coupled easterlies associated with warming into the Holocene as the north–south thermal gradient weakened. The abrupt climate shifts identified in Greenland ice cores transformed understanding of the climate system. Although primarily studied in the paleoclimate record, abrupt climate change induced by greenhouse gas rise poses a serious threat to modern humans and ecosystems. We present the first ultra-high-resolution view (hundreds of samples per year) of the abrupt onset (within 1 year) of the current interglacial (warm) climate retrieved from the Greenland Ice Sheet Project Two (GISP2) ice core archive. This abrupt onset is manifested by a marked reduction in storm event frequency and increase in the length of the summer season around Greenland. We apply this metric to the current rapid climatic amelioration in the Arctic as a precursor for future abrupt climate change events. Copyright # 2013 John Wiley & Sons, Ltd.
Basically, I don’t know that this tells us a lot about today, except that natural climate change is an ominous force, and there is much we don’t know about what drives it. Until our models could explain these dramatic natural shifts, why would we pretend they can predict the climate now, or pick apart natural or unnatural changes in a climate that is always changing. *”minerals” corrected to “element”. Thanks to John for spotting that. The YD has all the hallmarks of an extraterrestrial impact, which appears to have put a damper on the early Holocene. It wiped out the Clovis, but Australia’s indigenous population survived. as did the Africans, Europeans and Asians. Why point out the Australians? Basically it is because you have no idea what you are talking about. While you are at it… tell us your version of the origins of the clovis? Do you get paid by the word at gee Aye? No particular reason, but from what I’ve read the SH was spared the worst effects of the cosmic bombardment. Although there is no denying the effect was universal. ‘Radiocarbon and cosmogenic dating of glacial moraines in regions all over the world and abrupt changes in oxygen isotope ratios in ice cores indicate that the Younger Dryas cooling was globally synchronous. Antarctica showed a warming trend during the YD, while in Greenland there was a sharp cooling. ‘Why point out the Australians?’ Maybe it’s to draw attention away from non-AGW catastrophic climate change that non-tech, non-scientific and probably non-politically motivated humanity along with most other species managed to survive with a little adaptation to their changing environment. I don’t think you are supposed to mention that. You are getting a bit close to the theory of evolution, and the hypothesis that a species will progress more than it will regress. Don’t forget that we are supposed to believe that mankind lived in perfect harmony with nature until he discovered, by accident, how to make fire, and from there, how to make steam which, as we all know, was the root cause the calamity, that we call the industrial revolution. gee Aye is a fervent believer in this, and will get very upset if he/she/it thinks you are taking a verbal urine sample. A fervent believer in what? You nominated a number of things, not all of which were well enough defined for me to know whether I am fervent, middling or not at all. OK, then let’s just settle for “generally confused”. OK I am a fervent believer that I am confused. The ratio of Ca to Na appears to be the same during the the two cold periods. An increase in other metals at the start of the YD might give some clues but the data shown doesn’t support it. The last graph is of the end of the YD. With only one site, the best interpretation is that the winds changed at the end of the YD. Storms bringing dust from dried up corals back to more sodium as the sea levels rose? iron levels at the beginning of the YD would be good (dust had larger ratio of Ca as the sea level dropped?). There appears to be two sites. Shouldn’t the data from the other site be included to get some idea of how the levels might vary over the different sits. Australia’s indigenous culture is the result of a series of migrations dating back over 60,000 years. The most recent migration was from southern India around 4000 years ago. Prior migrants included Melanesians and Negritos. The idea that indigenous culture of Australia was homogenous and unchanged for 40,000+ years is utterly ridiculous. We don’t really know what happened to early Australians 11,000-12,000 years ago. So which ones are getting the “you own everything” treatment in the changes to the constitution. The original inhabitants or all the genocidal enthusiasts that exterminated them, or the subsequent ones who …. etc. etc. Bloody johnny come lately mob that turned up only 4000 years ago claiming to be indigenous! Ship ‘em back home, that’s what I say. The whole continent was occupied throughout the YD , except perhaps southwestern Tasmania parts of the arid interior. “But I also find myself wondering what life would have been like if ice ages were also full of ghastly storms. How did people cope? Indeed! Especially if they no longer have access to cheap reliable energy. We have many current examples of how quickly local infrastructure breaks down as seen by snow in the USA and floods in the UK. The only option would be to completely abandon these regions. The ports would freeze solid and the cities would be buried under vast ice sheets within a few years. You’ve been watching, “The Day After Tomorrow”. So from this, we can deduce this year’s winter storms in the UK are clear evidence of global cooling. On the other hand, the drought in the western USA is obvious evidence of global warming. Down south in Australia it has apparently been a little warmer tha usual, clear evidence of………. In the alarmist world if a weather event ‘proves’ global warming you trumpet about it, but if it ‘proves’ global cooling then you ignore it. The global cooling signal is present, a wayward jet stream produces extremes in weather. The Great Fire of London happened during the LIA, assisted by searing heat from the Sahara. Didn’t you know, warming is evidence of climate , whereas cooling is just evidence of weather.. There is no such thing as global climate btw. , just global Climate Science, which gives the less gifted a shot at the sinecurity of Academic life. Is this a candidate for the dumbest thing ever said about cimate change, even on this site? But I also find myself wondering what life would have been like if ice ages were also full of ghastly storms. How did people cope? Skara Brae gained UNESCO World Heritage Site status as one of four sites making up “The Heart of Neolithic Orkney.”a Older than Stonehenge and the Great Pyramids, it has been called the “Scottish Pompeii” because of its excellent preservation. Skara Brae was an underground neolithic village built in one of stormiest parts of the planet. It was certainly built some tens of thousands of years after the Younger Dryas cold period but shows that the people of those times were just as resourceful and adaptable and perhaps far more so than any modern equivalent today. And note the comments on how huge North Sea storms back in the 1850′s at the end of the LIA and a century and half before anthopogenic CO2 was claimed to be leading to more intense and greater numbers of storms from a global warming were responsible for uncovering Skara Brae which had been buried for all those thousands of years past. In the winter of 1850, a severe storm hit Scotland causing widespread damage and over 200 deaths. In the Bay of Skaill, the storm stripped the earth from a large irregular knoll, known as “Skerrabra”. When the storm cleared, local villagers found the outline of a village, consisting of a number of small houses without roofs. William Watt of Skaill, the local laird, began an amateur excavation of the site, but after uncovering four houses the work was abandoned in 1868. The site remained undisturbed until 1913, when during a single weekend the site was plundered by a party with shovels who took away an unknown quantity of artifacts. In 1924 another storm swept away part of one of the houses and it was determined the site should be made secure and more seriously investigated. The job was given to University of Edinburgh’s Professor Vere Gordon Childe who travelled to Skara Brae for the first time in mid-1927. On the Clovis Culture, there is strong evidence that A South American culture closely related to the Clovis Culture was also existent around the same time and it also disappeared or was absorbed as other cultures developed in it’s place. But just to really stir the Clovis Peoples genetic origin’s plot from a most unlikely but highly regarded news media outlet, Spiegel Online International comes this report on the Clovis period human skeletal remains of a boy found in present Montana a few years ago. It seems that the Clovis Culture may have abruptly disappeared but the people or a remnant of survived and repopulated the North American continent creating a new and later culture . Alternatively Siberian origin peoples genetically closely related to the Clovis Culture peoples as can be seen in this research again crossed the Bering Straits land bridge from Siberia to what is now Alaska when sea levels were 30 or more meters lower during the great ice ages than the present by following the edges of the ice sheets to again re-populate North America following the end of the Younger Dryas cold period catastrophe. In eastern North America some very new genetic analysis suggests that some eastern North American tribal groups have a fair sample of European genes in their genetic make up. The current theory being that the early European neolithic or even earlier peoples went west from what is today Europe along the edges of the great ice sheets no doubt on the usual ancient nomadic hunter movements that followed their prey until they reached the American continent and there inter mixed with the resident populations located in eastern North America. I think we seriously underestimate the immigration of those ancient peoples as they spread across to every part of the Earth where human survival was possible despite some of the harshest conditions that mankind can endure. As another example Tierra del Fuego right down at the tip of South America in Patagonia and about as miserable place to settled as anywhere as well as being about the furtherest place on the planet that anybody can walk to from our human origins birthplace in east Africa some 2 million years ago was settled by about 8000 BC. The last places to be settled on the planet were the very remote Pacific Island atolls and the last significant land mass NZ, which were settled in a great sea borne migration from out of regions around the Philippines by about some 600 years ago. Unfortunately this is a very poor example. Apart from gales the Orkneys have a very mild climate due to the Gulf Stream. Annual temperatures range between 4 and 15C. Snow falls infrequently, rainfall is regular and plentiful and the soils are extremely fertile. Skara Brae was built during the Holocene Climate when northern Europe was even warmer than today. Skara Brae was built during the Holocene Climate Optimum when northern Europe was even warmer than today. Don’t forget the Ainu in Japan if you are looking for “european” sources of american indian ancestry. Does that include some of your own ramblings? I just thought he was referring to his own comment, in a self referential, recursive sort of way. One would have to read all his other comments to know for certain. And maybe include many of BA4′s. … but I, for one, am certainly not going to do that just for conformation’s sake. I’ll just accept the high probability that they are all equally dumb comments. Wow, not smart enough to recognise blatant sarcasm, but smart enough to be an alarmist. That resolution for ice core measurements: Is that possible at that distance in time ?? It’s amazing what can be deduced at a distance, safe from the evidence of more direct observations. Just look at Mann, Jones et al.’s desperate attempts to rationalise proxy data with real world observations since records were available. The real world observations must have been wrong. There appear to have been much more violent storms in the ice ages, when it was a good deal colder. During those periods it was not so considerably colder at in the equatorial regions. The temperature gradient difference between the equator and the poles was greater. It is this temperature gradient that is the root cause of the weather systems. This paper is consistent with what Richard Lindzen has been saying for years – warming should be expected to reduce violent weather, not increase it. Exactly. The reduction of temperature gradiant between the poles and the more temperate latitudes is associated with (natural) warming (business as usual), which is predicted to diminish storms, which is the case. The more recent obsession with unpleasant variations of weather as an MSM proxy of climate by the deeply-dumbed-down (DDD) is their undoing. I have not read the paper yet, but I’d like to see some modern synthesised core going through a similar process to the ice core. One can postulate that the abrupt changes in Na, Ca & Fe are related to dust transport, but how severe the weather change was would surely be hard to calibrate? Yes but, warming (even warming 2000m deep in the ocean) makes it colder (by creating the sort of polar vortex also soon on Saturn). And since cold leads to more storms, AGW will increase storms. The detail (if correct) is quite amazing, it’s good to see an actual scientific method applied to try and explain the planets climate shifts without the CO2 obsessed cult followers screeching from a soapbox. I was actually taught in school that Vikings gave Greenland it’s name in an attempt to lure settlers there as it was so inhospitable, this never made sense to me as Vikings liked to turn a profit so why attempt to settle a place that gave no return for effort?, later after learning of the medieval warm period it started to make sense. Fancy learning from the past to explain the present, take that post modern science! Why did they name Iceland? Iceland is actually quite green and fertile. I think people have ignored that the old English word for island is igland from the old Norse for island, ieg. It changed to island because of the French word for it, isle. You can see how the Vikings could have just called it the ieg land to the west and it gradually morphed into Iceland. Similarly with England. Because of the Angles, the ieg land to the SE might have become England. But the Angles, Picts, Scots, Celts, Mercians, Bretons, and Franks, were well established in, what is now the United Kingdom, several centuries before the Norse and Viken went adventuring in the 10th century. The name England becomes popular in the late 9th century, the same time that Danelaw is introduced. Wikipedia points out that the Welsh and Scottish name for the English was based on Saxon. Why England instead of Sexland (pity) is a bit of a mystery, unless the Vikings were referring to it as the iegland or something similar. I did check up on it. Then I will have to bow to the superior authority of Wikipedia. The Danes pronounce “Angle” as “Ingle” (as in “tingle”). England is simply a contraction of “Ingle-Land”. Yes, but the question is why England instead of Sexland and Iceland instead of Snowland (Snæland) or something else. The suggestion is that they original referred to it as isle land (ig land) because it was a big island so they went with what was close to what they were already using. Isn’t it amazing what sticks ? Nothing quite sticks like the memories evoked by drift ice apparently. Just ask anyone about the, somewhat less than expeditious, Christmas Turney expedition in years to come. The forests in Iceland are quite extensive too! A few years ago I saw an ancient map on the wall of a government office in Reykjavik. In common with all governments, they like to build grandiose buildings Icelandic style means covering them with gold bearing quartz. The point of this is the Vikings may have gone to Iceland and Greenland looking for gold. Just remember, you heard it here first. Although primarily studied in the paleoclimate record, abrupt climate change induced by greenhouse gas rise poses a serious threat to modern humans and ecosystems. They were doing okay until they injected the above into their abstract. Until that moment, observed changes (by ion proxy) were fascinating and due entirely normal climatic variation. Doubtless, this was a funding requirement. It would be nice to have read their grant research proposal. Needless to say, there is at present scant evidence to support the hypothesis that the increased and minute fraction of anthropogenic GHG causes or will result in unfettered CAGW, let alone be detectable beyond normal variation whilst there is good evidence courtesy of the IPCC to the contrary. It becomes almost like the user instructions that come with new products these days. Full of mandatory throw away safety statements and warnings, in so many languages to achieve CE marking, that most users do just that. Throw them away and judge a product by how easy it is to use without the instructions. CE Marking is purely a market (protection) mechanism. Any impression of quality it may give is incidental. It’s still Buyer Beware (or Caveat Emptor) as the Romans would say. Often wondered what that stood for . The little bureaucrat who was given the job of finding a suitable name for that bureaucratically imposed standard must have had quite a quirky sense of humour plus a bit of Latin as well. It was from a colleague working in the standards development that I learnt that. The emphasis being very much on deregulation and self-certification, I know how many corners get cut, and matters of interpretation get exploited when relying on such methods. How I love a dumb down thumb. It’s made my Sunday. Champagne tonight. Storminess seems to be associated with cooling. The asteroid theory of the YD, but still no definitive proof. you can’t take Greenland ice core data and extend that into how weather is performing all over the globe. That isn’t science, that is gossip. Furthermore Greenland weather/climate is subject to fluctations in the flukey end of the Atlantic conveyor. There are so many factors that influence how and where the conveyor delivers its tail end energy. This a microscopic study which requires a large nunber of studies from other parts of the globe and specific to that time. The authors name is Mayewski, since you asked. the beginning of the Holocene offers an important past analog for the onset of modern warming. 1994, 1997; Meeker et al., 1997; Meeker and Mayewski, 2002). Global circulation models failed to predict the rapidity and scale of decay in Arctic summer sea ice currently in progress. I think you are being too harsh on them. But do let me know when you figure out the natural driving factors of apparent abrupt shifts in Greenland. I was refering to the author of the unasigned thread. It was a fair comment, and should be applied to the alarmist side of the argument, too. I mean, a lot of the whole scam is based on contentious research into the rings of 12 bristlecone pines. Well spotted BilB. You have just discovered one of the factors which affects the size of the Arctic Ice Sheet. Climate science is grateful, your Nobel is probably in the post..
Quite so KevinL, but that is not what is affecting the Arctic dominately in my opinion. If you think about the various effects operating in the region you will see that there is missing information. Consider the many factors here…. The NewScientist.com news service reported on 30 November 2005 that the National Oceanography Centre in the UK found a 30% reduction in the warm currents that carry water north from the Gulf Stream from the last such measurement in 1992. The authors note that currently the observed changes are “uncomfortably close” to the uncertainties in the measurements. However, the North Atlantic is currently warmer than in the earlier measurements. This suggests that either the circulation is not weakening, or that, even if it is weakening, the weakening is not having the hypothesised cooling effect, or that other factors are able to overwhelm any cooling. The New Scientist article was based on an article in Nature. In News and Views in the same issue, Detlef Quadfasel reinforces the point that the uncertainty of the estimates of Bryden et al. is high, but says other factors and observations do support their results. Quadfasel continues by pointing out the significance of the possible implications, with palaeoclimate records showing drops of air temperature up to 10 °C within decades, linked to abrupt switches of ocean circulation when a certain threshold is reached. He concludes that further observations and modelling are crucial for providing early warning of a possible devastating breakdown of the circulation. The Bryden results could be caused by natural variation, or “noise”, that is, coincidence. While previous shutdowns (e.g. the Younger Dryas) are thought by some scientists to have caused cooling, the current overall climate is believed to be different; in particular, sea-ice formation is hypothesized to be less because of overall global warming. There is a lot going on in this region and much of it is seemingly contradictory, when in fact it is not if all of the influences are brought into the evaluation. I suggest that the missing part of the puzzle is the possibility that Brian Farrel was right and the Northern Hemisphere is moving towards an equable climate and the seemingly contradictory weather effects are all part of the temperature balancing process that will some indeterminant period of time to resolve. Cut and paste from Wikipedia without attribution? Naw he’s probably the unbiased author or editor at Wiki…..
BilB – Bill – William – William Connoley. Worse than that, the plagiarised text refers to a New Scientist web article “abridged” from the full article in the rag. It is hard to think of anything less reliable. Yep and all caused by fluctuations in the Sun output frequencies and magnetic fields. The Earth is always playing catch-up. The cessation of warming from 2000 is due to the sun have a snooze. The Earth is now heading into a cooling phase as the excess energy leaves the system in various ways. 2nd last line…… have -> having. I must proof read more thoroughly. It will come as a great shock to millions of people around the world when they discover that our star is the main driver of this earthly climate. Where did you steal that from? Such a criticism is usually reserved for anecdotal evidence. Please refrain from aping people with a real point to make. I do believe that I have covered that, Jo. In that thread the use of denial was totally appropriate. The article’s author was denigrating the university for its use of creative advertising and denying Richard Warrick the respect due for the international recognition afforded him for his research. I think that the use of the word “denial” in that environment, in that context, was entirely appropriate. Apart from that my denialist reference was NOT directed at anyone specific. In fact I was proffering a slogan in balanced alternative to that used in the article. I do agree though that the aural image (obviously uncovered with vigorous research) of Richard Warrick smacks of self obsession. The whole thing hinges on what is “verifiable reality”. I think that I could legitimately say that the greater body of scientific opinion on AGW is reality and the contrary is denial. To that one might reference Galileo versus the Church, not a parallel. Alternatively you might be thinking of Marshal and Warren peptic ulcer bacteria as denial outcome, but to match their achievement you might have to swallow the bitter pill and do some environmental modelling yourself. The other parameter here is the one of immediacy in the face of public risk. I’m not saying that you have not but I have not seen a plan “B” from the “natural variability” camp. What if you are wrong? This is a global public safety issue as so many of your contributors point out but only from the “huge expense” and waste perspective. The “warmists” say that the process of taking climate change action runs at a profit and extends the life of our global natural resources. If it turns out that the action was over reaction the cost is actually a win win win situation. What is the natural variability outcome? Go for maximum short term growth and profit, and figure out what to do when resources expire sooner? While Jo is correct to identify that as a diversion away from the topic you are attempting to have, I do think it is actually one that desperately needs to be addressed as well though. But what if that money was instead spent on really trying to stop those events instead of trying to stop what is somehow believed to cause them (despite history showing otherwise) – that is, what if we really tried to limit the scope to even stop things like Drought (Aqueducts and Water Storage Tanks), Forest Fires (Dry Underbrush Removal), Floods (Dredging), etc – we do have the capability to minimize to maybe even stop those things from happening, but we aren’t spending money on those things because we are off chasing the mythical cause of them instead of addressing the actual problem. Then let’s move on to what is really behind most of this. “Climate Change” pushers always, in the end, let it be known their real concern is ‘population growth’. While I will give you that limiting CO2 will limit population growth (plants struggle to grow under 300ppm CO2 levels so lower CO2 means lower crop production, and cheap energy not being available to everyone around the world means many will die from water contamination, hunger and cold/hot weather spells. Add to that the money spend on ‘Climate Change’ and higher energy costs could be spent learning better ways to produce crops which are less unacceptable to weather conditions and other threats) we could just make sure we could support population growth instead buy putting money into food production (a lot of which is helped by limiting the natural disasters from the above paragraph …nothing ruins the environment like politicians appeasing environmentalist groups efforts to ‘save the Eco-system’ despite those politicians knowing their inaction to minimize/stop the natural disaster will have a devastating effect on said Eco-System.) What do you feel is a better way to address things, panic and waste money doing things which literally hurt mass amounts of people today in an effort to limit how many people exist tomorrow, or spend money to make sure we can always best support what life there is? So add it all up – in this foolish attempt to chase the CO2 bogeyman, we have increased damage from Droughts, Fires and Floods (things which kill both people and wildlife, plus destroy natural habitats,) limited peoples abilities to survive on a daily basis (which mainly kills people in 3rd World and poorer Countries as these people don’t have the money to spend on unbelievably expensive energy that could have been cheap) and used Windfarms and Solar Panels (which fry birds) to kill off a ton of (oftentimes endangered) Wildlife – woohoo, good for us? But those things are a “a win (more nature destroyed) win (more people dead/suffering) win (more wildlife killed) situation” just on the off chance CO2 does somehow warm the planet “unnaturally” despite the planet not actually warming outside a completely natural cycle? denying Richard Warrick the respect due for the international recognition afforded him for his research. I think that the use of the word “denial” in that environment, in that context, was entirely appropriate. In that case, the IPCC are deniers for denying him the right to call himself a Nobel Laureate. Alarmists are deniers because they neglect evidence that contradicts their models (I notice Philip is still going on about the lack of a pause in the warming). Becky back in high school was a denier because she …. best not go there. A scientific opinion which is falsifiable is a statement about reality, regardless of whether the statement is true or false, but the statement itself is not the reality. Arrgh, what am I even saying this for? Technically, you are the denier here, BilB. The author does not deny that ‘respect’ or ‘international recognition’ exists, but rather, is pointing out that other people may not share that view. It seems you would deny the author the right to do this. Perhaps you could have linked to a photo of yourself burning the printed manuscript? The Greenland ice source is snow from over a wide area of the North Atlantic and North America continent, so the ice core is valid proxy for this much wider area. The Younger Dryas was also at first identified in the ice cores and then was proven again and again over the globe. They “coped” by not occupying vast areas of the Northern Hemisphere. If these weather conditions returned most of Europe and North America (above 40′N) would soon become uninhabitable. ‘ and warming means less storms’, well that’s well known and even part of CC theory! Because AGW produces more wind sheer and this tens to stop storms from reaching their full potential. But when they do, they become more powerful and turn in to ‘super storms’! Which did not happen with Typhoon Haiyan. Edited from http://www.bbc.co.uk/podcasts/series/drkarl under fair usage policy. I believe the children are our future, teach them well and let them lead the way. Show them all the beauty they posses inside. Give them a sense of pride, to make it easier. Let the children’s laughter, remind us how stupid warmists are. And your proof that this is happening. nb: youtube does NOT constitute any sort of proof. I believe you really don’t have the vaguest clue what you are talking about, and that you live in a tilted mind of total fantasy. As evidence, I put forward any and every one of your posts. QED. Pure BS – wind sheer is a ground-effect up to a few hundred feet agl. No, wind sheer is merely two air masses moving in two different direction and can occur at any altitude. Low level wind sheer is important in tornado formation as it creates the spin. The wind sheer that disrupts cyclones usually happens at the mid levels. Cyclones are powered by vertical convection columns that are sheered apart if the wind at different levels move in different directions. Cyclones can only form in low sheer environments, generally a low level circulation centre (an eddy) will end up under a upper level high (calm weather). This study has nothing to do with tropical storms. It refers to high latitude storms that are driven by the temp difference between the equator and poles. Because the temp at the poles changes by a greater amount than the equator, a warmer climate has less storms due to a smaller temp gradient. Basic physics. Now if you were talking standing wave patterns that can operate up to and above 10,000 feet agl – maybe, but then that requires specific terrain and not AGW. Why do you say, “AGW produces more wind sheer …”? How do you know that only the anthropogenic contribution (if such a thing exists) is the only factor in wind sheer? Can you explain what wind sheer is? Will you tell us how the wind sheer effect comes into being? Please explain how any anthropogenic contribution to the above has any relevance whatsoever. Don’t waste your typing skills RW – BADJnrx4 doesn’t understand that wind-sheer refers to the phenomenon of a ground level air mass moving in a different direction to the air mass 100 or so feet agl and is largely unnoticed except by aircraft attempting to take-off or land in those conditions which can cause a loss of some or all ‘lift’ when the aircraft ascends/descends into the air mass that is moving in another direction. AGW did not predict more wind sheer. The story started when the AGW crowd predicted that the increased temp would lead to more cyclones. People like william grey pointed out that increased temp could cause increased wind sheer and reduce the amount of cyclones. (what has been observed). The whole thing is impossible to decipher though because it is massively influence by ENSO/PDO cycles so nobody really knows what is going on. Correct. Cyclones are driven by upper winds which is why forecasting their track is hard. But nowadays that information is getting easier to gather. And, as said, those very winds can, at times, destroy the integrety of the cyclone they are steering. This is simply basic weather facts known for decades. Track prediction is difficult because the steering winds change with the intensity of the cyclone. Basically weaker cyclones are steered by lower level winds than strong cyclones. But when they do, they become more powerful and turn in to ‘super storms’! One thing I have noticed of late is that there are far fewer storms, particularly TRSs, and those that do occur, tend to be quite weak. That they have become so rare could be why they are more widely reported; it could also mean that the locals become more lax in preparation for the event, as is a possibility with Typhoon Haiyan, in the Philippines, last year; it was NOT the strongest that had ever hit the islands, but certainly was reported as causing a great deal of damage. One of the key elements of the AGWists is that the poles are going to warm so much more than the lower latitudes (convenient, as the lower latitudes do not seem to be showing much temperature increase, yet the poles – or, at least, the Arctic – has melting ice, which is especially frightening); that this reduces the energy difference between the latitudes must, logically, reduce storm potential. I refer you to the link in post #12.1.1! youtube links are not a reliable source of information. Find some real science, ffs, or stfu . which I have listen to for several years, even before the internet and have found them to be a solid and sober source of information with the relevant experts. But I suspect it is not the type of source you would rely on, because its valid science! ‘but perhaps you might come up with some arguments of your own?’, why? You don’t! To tend to rely on WUWT, Monckton, etc. and any fly by night ‘expert’ that’s passing by. So how did you get the qualification you have? Are you telling me they are based on all your own work from square one? I think not! I suspect, know, you have relied on publications by earlier experts in your field. Likewise, the reason I can see so far with regards to AGW, is that I am standing on the shoulders of the appropriate giants. But he can see further than you! A recording of an opinion is just that. It is a recording. It is a singular point of view at one point in time. It is “push technology”. It gives no opportunity for debate, or discussion, or even questioning. Even if the content is thoroughly proven wrong and totally debunked, the podcast still remains lying around on the internet (with an emphasis on “lying”). So we have to assume that anything contained in any “fixed format”, such as a podcast is, at best, outmoded and at worst, totally erroneous. For this reason, they are generally not admissible in a court of law, under most jurisdictions. And that is why they are not a vehicle for communication, because communication is, by definition, two-way or multi-way, and modifiable, and knowledge is shared and expanded. BBC propaganda is NOT science either. Please go back to school and learn what science really is. ‘BBC propaganda is NOT science either.’ tell me, how is it propaganda? And from the BBC? But they are referring back to valid scientific institutions! So therefore in your world, the scientists are all part of the UN/Commie plot to rule the world! So that must include the vast majority in the world, not very likely is it! Your problem is that you are constantly working from a base of absolute ignorance about anything to do with science. That makes you a willing, open, target for even the most simplistic propaganda. You fall for it every single time. One big gullible sucker. ! The only thing you have actually proven is that you are talking the most utter poppycock; the title shows that: “Evidence that Typhoon Haiyan was caused by global warming.” Well, if you start with a conclusion, all the evidence you find will support that conclusion. Odd, that. “…a typhoon is a huge whirlwind…” Much as I hate to say it, the Cambridge doctor’s statements leave a lot to be desired, are woefully generic, and potentially racist: “…the problem is the buildings are so light-built because the people are poor…” A lot of Filipinos could take great offence at that. Typhoon Haiyan occurred during the typhoon season, a time when typhoons occur regularly in the western Pacific, as the sea-surface temperature has been raised by the season (as also happens in the North Atlantic, Bay of Bengal, Arabian Sea, and other areas of the Pacific) – THEY ARE NOT ONE-OFF ODDITIES, as implied by the Doctor – and Haiyan was NOT the worst typhoon “evah”, though it might have been the worst to hit that particular area. Many hit the Philippines, but many passing to the north, to hit Taiwan, and so on to Hong Kong and China; some recurve, and run up the Japanese islands. Beyond a certain limit, the course of a typhoon CANNOT be predicted beyond a few hours, but only surmised, so perhaps he was falling back on the standard soothsayer technique: predict often and wildly differently! ‘and potentially racist: “…the problem is the buildings are so light-built because the people are poor…” Of course you are jesting? There is no argument that it was a true statement! You are just looking for diversions from the bleeding obvious. And the “bleeding obvious” is? You are wriggling a bit, here. I might go as far as to suggest that the original comment, itself, was a diversion. Typhoons occur every year in the Pacific, some a severe, so less so – all have strong winds and heavy rainfall associated with them. The reporting of the typhoon depends upon damage incurred to the human environment – obviously, as far as the news agency is concerned, the greater the damage, the greater the story, hence the lascivious attention to Haiyan. Have the Philippines been hit by more severe storms? Yes. Were there reports of the intensity of those following Haiyan? No, as not the same amount of damage occurred. Look at the reports of typhoons that have hit Taiwan and China in the not too distant past – a great deal of damage done, to sate the media’s ghoulish interest, but no attempts to link them to AGW. So, what has this to do with global warming? In reality, nothing at all, but it does make a good scare story, which makes good copy, and so the story can sell more – and, not only that – you can lay the foundations for even more scare stories to sell even more papers. Think how much more could have been sold had the fear of AGW then been such that they could link the Taiwan and Chinese disasters to GW! News editors ain’t daft; they know how to sell their stories, and, once interest in AGW fades, a new monster will appear (“Global COOLING”, anyone?). At any given time, in the season, there are about a dozen typhoons floating around in the Pacific. But the Pacific is a big place, and sparsely populated, so most just peter out, and go unnoticed, unremarked, and unnamed. Lumo has a similar opinion on effect of warming polar regions. He makes no comment about severity, other than what might be inferred from his statement that if total polar-equator gradient has decreased then the maximum gradient achievable at any smaller scaler should decrease too. I would assume this implies less severe storms, as the centre of the storm cell, relative to surroundings, decreases in temperature and pressure by a lesser amount. BA4 says shear winds will normally blow away a storm. A shear wind would mean a wind at 90 degree horizontal angle to normal cyclonic flow. Strong upper level winds can inhibit the formation of cyclones. The strength of upper level winds are proportional to the lower level winds on average, since the upper level wind is just the return path of low level winds driven by equator-poleward gradient, which we’re told is decreasing in AGW. So upper level wind being weaker will mean proto-cyclones are less inhibited from developing further. Whether the cyclones happen less often but are more severe on the off chance they do occur sounds plausible if one assumes the low level wind is more variable than upper level wind even when the two averages have the same trend. At the same time, a temperature inversion is still needed to trigger a cyclone, which should also happen less often due to the lesser horizontal gradient and because a higher global temperature means increased convection speed and presumably less vertical variance in temperature. I can only conclude that definite conclusions are difficult to obtain. The Phillippines are in what is known to have nearly one hurricane a WEEK. Usually they are weak or skim vulnerable areas. In WW2 the USN had to often scramble the fleet from Manila and ride a storm at sea sometimes losing destroyers. The recent devastion was indeed caused by high winds but the most damage where the centre crossed received a huge tidal surge. Some video, like in Japan, was taken of this by those in second story stronger buildings. So, when does a carbon(sic) tax work? As of December 2013, 17 countries have carbon pricing mechanisms either running or planned. According to a recent study by the World Bank these cover greenhouse gas emissions of 10 GtCO2e/y, equal to 21% of the 50 GtCO2e emitted globally. Either we start seeing perfect weather REAL soon, or I’m calling man made Global Warming carbon(sic) taxes a FRAUD. And everyone associated with it. We need more wind sheer then! More GW. More GHE and Storm taxes on frugal little cars so people go back to V8s! More methane too, so I’m glad to see you are doing your bit. that was my rant. You stole it. “Fewer” storms not “less” storms. You have the opposite view to the consensus. Human-caused warming is always a bad thing, that needs to be mitigated by switching to low-energy lightbulbs, becoming vegetarian and putting a solar panel on their roof. The Chiefio has an interesting post on cyclical changes in tides, and therefore ocean currents here. The sudden change in atmospheric circulation might have had a lunar trigger. This evidence suggests that in an ice age phase the jets remain meridional with larger storms over larger areas rather than being forced by expanding polar air masses into a new zonal / equatorward regime as I had previously assumed. It looks like the only two options are zonal / poleward and varying degrees of meridionality rather than having a third option of zonal / equatorward. That may explain why the ice packs on the northern continents expanded and deepened to such an extent. It would need vast amounts of snowy precipitation to overcome the summer season melt enough to create such deep ice accumulations. Abrupt changes seem to have occured over a 3 year period. Can we conclude that the climate changes had nothing to do with atmospheric CO2 level? Can we therefore question why further abrupt changes to climate will be a result of variation in atmospheric CO2 level? I was just about to say something similar: Yes, interesting, if they really can reliably achieve such kinetic resolution. So can they now also measure CO2 levels with the same resolution? It sounds like you should also look up the meaning of the word verisilimitude. Some people use big words to confuse other people, while making themselves look unduly intelligent or knowing. For example, someone who seems, but is not actually, in possession of knowledge or wisdom is said to have the “verisilimitude” of such. Maybe you have found such a person. I think I have now. For example: Kevin “Programmetic Specificity” Rudd. You notice how language has a tilt in the way it presents things. All changes are “reforms”, for example, even when they threaten our freedom of speech. When you see a long word which is looking suspiciously innocent, beware! For example, “Quantitative Easing”. To what extent is that self-explanatory? Do you mean “quantitative easing” as a leftoid Keynsian construct? The leftists have to go easy on the quantitative in favour of their qualitative, subjective and emotional pursuit of the never never. Quantative Easing” arguably sounds a lot smarter than “printing more money”. I read a comment else where that the person was not going to pay attention to an argument if “multidecadal analysis” wasn’t used. I can’t tell whether or not you’re ‘mickey-taking’ but will bite anyway. The word you refer to is ‘verisimilitude’, NOT verisilimitude. Okay, someone will need to help me here as I see them vaguely reference ‘That’s Armageddon CAGW’ a couple of times, but I can’t figure out what the heck it has to do with their actual paper. Of course, today’s nice catastrophic storminess-less periods seems not unlike the entire Holocene period, according to their findings. So are they just saying the Holocene has been really, really, really nice and we should be hoping to stay in a climate that is as nice and warm as possible like it, instead of going back to a YD like period that was ‘omg, what the F*ing hell just happened to the sky’ freaky? …but wait, does that mean they pro Warming, despite hinting they might be against it??? And considering the Holocene seems to have begun in a time period that could fit between our Olympic Games, are they still that worried about the unbelievably slow Climate Change that is supposedly taking place currently during a time of “(Omg, omg, omg…) carbon dioxide levels rising faster than at any time over the last several hundred thousand years”? …besides, really, how do they even know “(Omg, omg, omg) carbon dioxide levels rising faster than…” is causing “Abrupt Climate Change” when said “Abrupt Climate Change” is like a snail climbing a 120 degree slope compared to the bullet-train “Abrupt Climate Change” they have us ridding to get into the Holocene in the first place! Here is a thought, perhaps there is a non linearity in storminess, If the earth cools a bit then storminess increases which increases emission, which cools the earth some more which leads to an ice age. Of course changes in storminess could in fact be the driver. This would seem to make sense as earths normal state is the ice ages, and we are currently in a very abnormal state. If this paper is right we could in fact flip into an ice age very quickly. Based on this it cauld just be a random walk, driven by storminess. Admittedly probably not a likely contender, but worth exploring. It is plausible that the ice ages were not the result of an overall decrease in heat energy in the atmosphere. Instead, it might have been ocean currents and wind patterns that stopped heat from the tropics moving towards the poles. You could easily picture a feedback leading to an ice-age where the more humid (absolute) tropics increase the clouds, rain and snow towards the poles. These in turn increase albedo and low P and storm cells that block warm winds from the tropics making the equator hotter and with greater absolute humidity. More rain could also affect ocean currents. If you find the next IPCC report claims models show that GW will cause the next ice age. Remember that you heard it here first. Total energy in the system is always minimised (that is the thermodynamic definition of equilibrium) The climate shifts you see are simply the world flipping between two different but equal states. Ie one state has low thermal (sensible heat) and high kinetic, the other state is reversed. Increased flow of energy from the equator to poles creates cooling, just like increased water flow from an engine to a radiator. If you read the last sentence, the postulate is not to be taken too seriously. In its defense, though, air is not a good conductor of heat. Its convection, wind and ocean currents that spread the heat around. Since we have uneven sunshine around the globe, it is never in thermal equilibrium. Soooo in a roundabout way they’re saying that the Holocene was caused by Greenland catching osteoporosis, basically. Not getting enough calcium in its storms. Meh. Makes as much sense as any other theory. If it starts getting too warm just send a boatload of PhysiCal up north and it’s sorted. I’m always struck by how much scientists can discern, determine, assert, discover, declare to be the truth and sometimes cover up from so little information. One lonely site? And they claim heretofore unprecedented ability to slice and dice the ice? I suppose global warming melted their evidence too. I’ll be content to watch the weather get colder and remember the fella (what is his name again?) who gets paid handsomely for his long term weather forecasts that are more accurate than anyone else’s. And, oh my! He relies on the sun in large part, not ice cores, CO2 or worthless computer models. Give me actual success any day! Has the Sun gone to sleep? If it indeed goes to sleep no amount of CO2 pumped into the atmosphere will warm this planet. Link from the BBC of all places. As the latter half of last century has been describe as a “Solar Grand Maximum”, which is well enough to account for the small amount of warming we might have had. The sun is now having a rest. The temperature has stopped rising, and the warmth is gradually leaving the system. Thing is, the CAGW mob discounted solar activity as a possible cause of the warming, so they cannot now use this lull as an excuse for the current plateau and the coming cool period. Either its the Sun, or it isn’t. It does appear to be the big shiny orb and its effect on the oscillations, particularly the NAO, but convincing the masses may take time. At least half the populations of the western world believes a harmless trace gas was responsible for warming the planet late last century and its impossible to tell them otherwise. In Australia aunty needs to tell the truth and quick, for the sake of humanity. 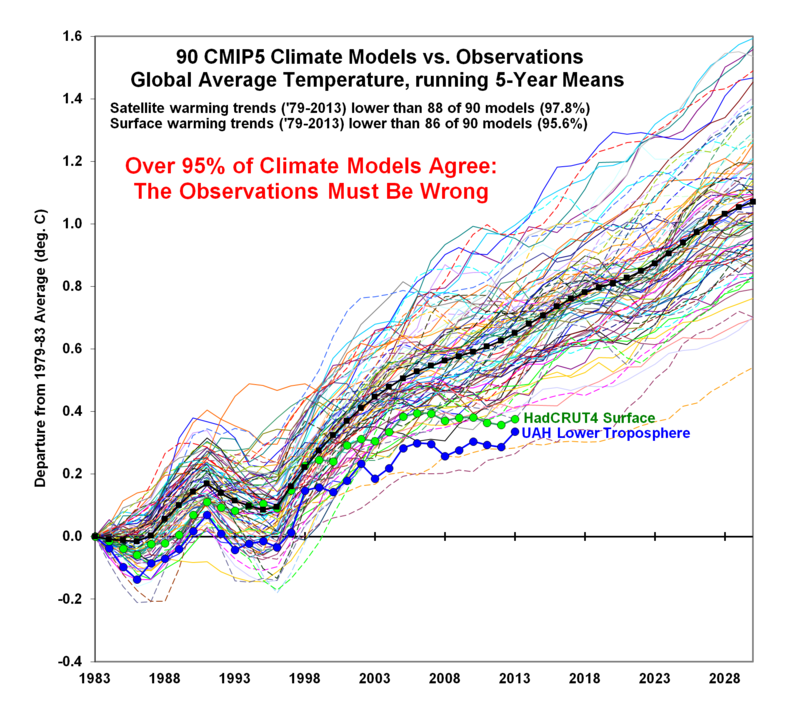 Any excuse to apologise for the failure of the models and let Climate Scientists off the hook. The inclusion of self publicist & fence sitter extraordinaire Mike Lockwood tells us all we need to know about their motivation. I suppose global warming melted their evidence too. You know the funny thing is, it is quite possible this actually is the case somewhere along the line. I hadn’t even thought about that possibility. I was thinking about it in terms of inability to preserve their evidence because it melted. But you’re right about it. Suppose there were intervening melts, how could they know? OT what have I found ? (well such as they could find anyone who would admit there is one). With Piers Corbyn (of putting the Met Office to shame fame), Lord Monckton(co-opted in at the last minute it seems), Donna (by video link), Buster Tree Guy, and started off by a recording of David Evans himself. Why didn’t you mention it Jo ? (or perhaps you did). Watch the Tree Guy, he’s great, and never mind the sofa. Thanks Joe, an interesting view. That Buster is a bit of a free spirit. Legalise Cannabiss parliamentary candidate 2001. He seems to have found a more acceptable solution to the tree problem since then though. I can see why Lord Monckton was slightly intrigued and didn’t just dismiss him like another Greenie. Very interesting video; Buster Nolan (the tree guy) is obviously passionate about his belief, but is also equally obviously mad as a box of frogs. Long may he live! We need people like him in life. A pity the likes of Brownwars and WWF couldn’t put anyone up for the debate. Buster is possibly distracted by some Greenie nonsense but he is out there experimenting & seeking evidence for himself and treating experts with a healthy disregard. And what is wrong with being as barmy as Buster? It is a good thing that persons such as he are prepared to buck the trend and explore alternative avenues. I suspect that he is not doing his work at vast expense to the tax-payer; I wouldn’t be surprised if he is doing it entirely off his own bat, and that is also a good thing. It is when the organisation has a budget that rivals that of small countries, yet continues to bleed the tax-payer dry while castigating that same tax-payer that I get annoyed. Very disappointed to see David using graphs with Giss data marked as “observed temperatures”. IT ISN’T !! The observed data has a peak around 1940 which has been adjusted out intentionally to create the warming trend. Hi Joe V, thanks for the link, It was tremendously entertaining and I know this is slightly O/T. One thing which I picked up from Piers Corbin was his reference to Alarmists as “Carbon Dioxide Delusionists” and I instantly thought how apt this statement was. I know Roy Spencer has had a change of heart and is going to call them AGW Nazis but I think this would be a better term. Maybe we should adopt the “D” word for the alarmists and call them “Delusionists”. I don’t know if delusionists exist. You have illusionists who create the illusion. Then you have the deluded who, quite understandably, are taken in by it. Taken in by it at least until some observant thinker comes along, sees through the illusion and exposes it. Or could delusionist just be a kinder term made up for those choosing to continue in believing once the illusion has been exposed ? Delusionist is a good word, whether strictly correct or not. Much more incisive and nothing like the deliberately offensive Denier word applied to sceptics. Delusion isn’t really strikes st the heart of the problem with CO2 Catastrophists. Jo, I agree absolutely with your latter point as this is the basic issue: we are simply not in a position to cherry pick single issues, like CO2, in the game of pin the tail on the donkey as “the cause”, and therefore “fix it” with a tax on CO2 and carbon “cousins”. Healthy sceptism is part of science, and we apply statistics to ascertain a level of certainty. However, particularly in the context of Holocene climate (the pre-warmist computer algorithm era), while I understand your sentence, I respectfully suggest, “natural climate change” might be (better?) expressed as, “a naturally changing climate”, as the former conveys an inference of the “climate change” meme underpinning the DAGW hype (with “carbon” as the prime culprit). My comment is not intended as criticism, merely an observation. I agree, as countless other do, with a theme of your blog: there is no definitive “proof” (though lots of assertions) that the changes we see in climate are anything outside the scope of natural variability. And it might be decades before we are beyond the threshold of rudimentary understanding, where I feel we are now. I feel precision in language is important (as no doubt you concur) and I highlight the above only to illustrate our universal susceptibility to use contemporary terminology. We know what we mean with what we said, but others often interpret terminology differently for their (sometimes conflicting) argument. A different illustration is the use of “No-till” in agriculture. Many would interpret that to mean, literally, no soil disturbance. But in reality it’s all tillage, only the degree of soil disturbance varies (widely), and it’s full of confusing semantics. Don’t we make up for them on the roundabouts? Dr Roy Spencer takes the gloves off. I’m amazed that others are still using polite PC ‘tut-tuts’ and waving fingers against an abusive and threatening CAGW army. Soon we will here that storms are in fact good, so we still have to stop AGW. So we have just had another White Night Festival in Melbourne. Organisers are crowing about 12 hour light shows across Melbourne and 500 000 visitors. I wonder if the Federal Member Adam Bandt (Greens) has calculated the carbon footprint of this festival, I also wonder what measures he has suggested the City of Melbourne enact to abate this willful spewing of massive amounts of the evil pollutant CO2 for this and all the other festivals held in his electorate? The Greens are just total hypocrites – do as I say not what I do. You would have to be an apology of a shadow to admit voting for these idiots. But then the latte set in central Melbourne are the ones who think milk comes from a carton. You have to look no further than Ms 1.5% Sarah Hansen-Young. How she can possibly represent or present any sort of intelligence is beyond me. Not only do we have White Night but the incredibly stupid earth hour turning off all the lights and then the very next hour they are all turned back on using more electricity than would have been used. Add to that the southern culture of daylight saving. Up here in Qld, we have very little twilight, the northern cities next to none – so we use more power, which I am also sure happens in the southern states – you just switch your lights on in the morning earlier. The whole daylight saving arguments just burns more electricity. There are lots of these social events all developed by the bleeding hearts to make everyone feel good, but the negative bits are never taken into consideration. I just hope that the Greens take a lethal dive at the next election and go the way of the Democrats and dinosaurs. But Boris, you hear from Sarah Hyphen-Hyphen because she is their spokeswoman. In other words the most acceptable to the public and probably the one with the most common sense. Doesn’t say much for the rest, eh? The Greens vote will decrease but there is always a residual of the stupid and the gullible. The best we can hope for is that they don’t make the quota for a senate seat. That would mean that only the ABC would give them publicity. As for their ideas consider their approach to reducing carbon dioxide. They claim they want to reduce CO2 but reject every practical way of doing so. We could reduce CO2 emissions by modernising our coal fired power stations – the Greens are against it. We could reduce CO2 emissions even more by switching to Closed Cycle Gas Turbine stations – the Greens are against it. We could reduce CO2 emissions by 80% (in electricity generation) by going nuclear – the Greens are against it. They insist we must somehow use fluctuating supplies from “renewable energy” which can only deliver emission reductions by having adequate storage e.g. hydro/pumped storage – the Greens are against it. If someone came up with a cheap, safe way of eliminating CO2 emissions rest assured that the Greens would be against it. They just want an excuse to frighten the gullible and carry on like (I don’t think the ending will get through). I have a bit of a theory about Daylight Saving when applied to rooftop solar power, and bear with me here, because this is interesting, well, to me anyway. The rooftop panels only generate power when the Sun is shining on them, and the most when the Sun is shining almost vertically on them, as power generation in the mornings and evenings is lesser than at the middle hours of the day. Now, the panels generate DC which is then converted to residential AC by the Inverter. The first point of consumption is the residence itself, so the Inverter supplies all the residential needs first and the remainder is then fed back to the grid. Productive power generation time during Daylight is from (say) 8AM until around 4PM, keeping in mind that due to the angle of the Sun in the early AM and late afternoon will see the panels generating much less than the total they are capable of generating at maximum. So, outside of those daylight hours the residence reverts to taking all its power from the grid, or at those lower panel generation times, then also from the grid as well, to fill the requirements of the residence. So in the morning when residential consumption rises, then the panels supply the little they do, and the grid supplies the rest. People go off to work and that residential consumption falls, just the fridge compressor cycling around the Clixon temp setting and maybe the hot water system, and other stuff the residence may leave in a standby position. So, when they leave for work, and their consumption falls off a little, this is the time when the panels begin to increase their generation, as the Sun rises further. Now, the home still fills its needs first and the remainder goes back to the grid. Into the afternoon, generation falls away, and when people come home from work, and switch on everything, consumption goes up, the typical evening residential power spike, most noticeable on a Winter Load Curve, but still also there on the Summer Load Curve, just covered by Commercial high power usage and also Industrial power usage. Now in the evening, around 4.30 onwards the residential peak kicks in, and typically, this is when the panels are either generating very little, or in fact virtually nothing at all. So, all this residential consumption is virtually all from the grid. However, with DST, then the panels are still generating. Instead of that electricity being fed back to the grid, people are now home from work, and the residential late afternoon peak kicks in. Now, instead of all that electricity being fed back to the grid and earning big money for those panel owners, the residence itself is consuming that electricity, so they are now not getting that huge FIT. Some may say that what they lose in the evening is offset by what they take from the grid in the AM, (instead of from the panels) but that evening peak is always considerably higher than the morning peak. Shh! Don’t tell the watermelons. Spot on as usual Tony. I keep a very close eye on our generation and usage numbers at home and BY FAR and AWAY the rate of generation after the sun is past its apex is considerably higher than in the AM. For example the unit will generally manage to generate about 8KW by Noon but generate another 10-12 by sunset. Its extremely rare to see a number higher than 8kw before noon (north facing panels) but if the sky remains clear, the days it reaches 8KW by noon will be the days it hits 20-21kw for a full day with 21kw being the highest it has ever hit. I never considered it the way you layed it out, but that fits nicely with both common sense and my observations of our system. One of those was a recent article I read claiming that rooftop solar power now totals the same as for a large scale coal fired power plant, because they have almost One GigaWatt of panels installed, and half a million individual installations. Now, see the problem with that. They have used that old standby ….. Nameplate Capacity. 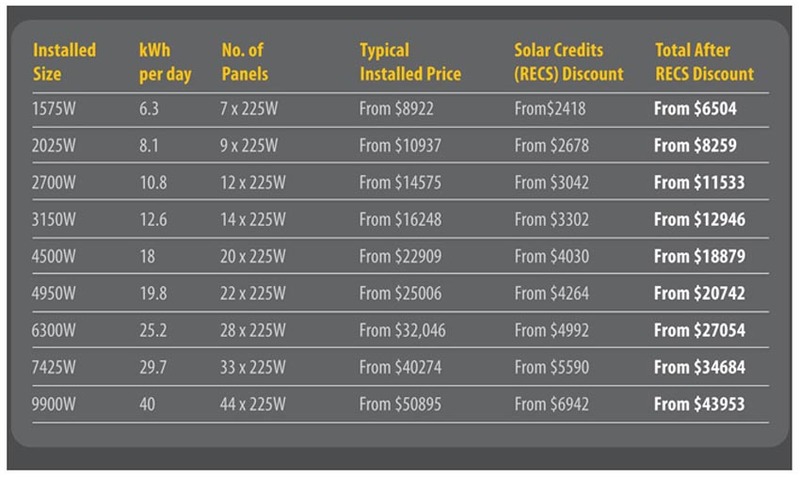 It’s around 960MW of nameplate, and the average installation comes in at just on 2KW, as you might imagine, the biggest seller being the cheapest, a 1KW installation, lowering the average to 2KW. As I have always said, the correct way to look at it is is with actual power being generated. Note that it shows here a 2KW (average installation) system will generate (theoretically) 8.1KWH of power each day ….. and remember that’s only during daylight hours. Now, using the same industry formula I always use, this gives that installation (and the same for all installations) a (theoretical) Capacity Factor of around 16.6%. Keep in mind that the real average is actually closer to only 13%, but hey, I can use their figures. That CF is averaged across the whole year, so higher in Summer, and lower in Winter, so that 16% is extrapolated out across the whole year. The average residence consumes close to 1KW each hour (1KWH) during daylight hours, more in the AM, and even more in the late afternoon, and into the evening as the Sun sets, some more, some less. That’s with both Mum and Dad working and the children at school. There’s consumption in the morning prior to leaving, and then in the afternoon when they get home, and even while out of the home as the Fridge cycles the compressor, and (in most cases) the hot water system also cycling as well. Si that average is around that 1KWH. So, in fact little power is being fed back to the grid, except for during those bright mid day and early afternoon periods when the panels are generating at their highest. At this time, (keep in mind this is for that average 2KW system) then half the power is being consumed by the residence and half going back to the grid. So now, we have 1KW multiplied by half a million installations or 500MW, but that is for only a few hours, and now, keep in mind that this is spread across the whole Country, so, it’s not just a localised power plant supplying. Each grid area might see very (very) little power from rooftop solar. Even so, for these four hours or so, that 500MW is still only 1.6% of all power being consumed, and this is barely for those four hours around Midday, because prior to, and after that time, rooftop generation falls off pretty dramatically. Overall, on a 24 hour basis, averaged across the year, you are now looking at rooftop power supplying barely 150MW of its 960MW Nameplate, which comes in at around 0.5% of average daily consumption, and that is the total, in other words, what the residences are consuming and what is fed back to all the grids, so half of that fed back to the grids means that rooftop solar is supplying the grid with 0.25%, of total grid power, and again. let me stress that this is for the theoretical 16% Capacity Factor, as it’s closer to 0.15% or less even. So, when you read and hear claims that rooftop solar is doing heavy lifting during the Summer, be skeptical, be really skeptical. They’re cherry picking one clear and bright Midsummer day, across the WHOLE of Australia. Post Script. Incidentally, Safetyguy66, look again at that chart I linked to, and note the total (again theoretical) generation for rooftop systems. You mention that your peak has been 21KWH for your 8KW system. The quoted 21KWH they have as their total is for a 5KW system. See how theory never lines up with actual. My apologies on my description. The system is a 5kw system, I was pointing out that it generates about 8kw in the morning and about 12 in the afternoon on good days. Our usage is a pretty consistent 44kwh per day. So in the height of summer (because I have been watching the numbers on the system since last winter) we are returning about 40% of our use on average. In other words a cracking day of production is 21.5kw (that’s the record so far) and an average day is about 11-14kw. A small amount of cloud cover reduces efficiency noticeably. When all of that’s calculated into our bill at the top FIT rate in Tassy in reduces our bill by about 30% in summer and about 15-20% in winter. When you then calculate that Tassy still has by far the highest FIT rates in the country, Im not sure I would bother with a system like this if I lived somewhere that had a lower FIT or less good useable sunlight. I guess I should graph like 12 months daily operation to be accurate, but that involves work and Im allergic to work lol. You say you are averaging 14KWH which gives you a Capacity Factor of 11% overall. Again, see how reality never quite matches theoretical. The average for rooftop systems in between 9 and 13%, depending on where you are. I haven’t heard anything from Sydney’s bike-riding‘green’ Lord Mayor regarding the massive pollution caused by the annual fireworks display. I guess money is heavier than CO2. “They use minerals like sodium (from sea salt)….” Better fix the chemistry here! Where’s the booboo? So called climate scientists seem to cheat openly in their product of graphs. For example they remove the Y axis zero, a cheap trick to make changes seem visually dramatic when they are actually small. One of the worst graphs is the bolting on of aerial CO2 measured at Mauna Loa onto ancient ice core measurements without justification or comment. This process breaks every rule in the science book as the measurement techniques are so utterly different. In particular CO2 gas trapped in ice is critical because it is solid at -57C but gas at -56C. A few relatively warm years close to the formation years and you have gas escaping or leaching through the ice and the time resolution drops dramatically. So it is nice to see the variations with Na and Ca measures. They are violent and sharp. That means they have resolution with these measurement which is totally lacking in the CO2 measurements for ice cores. It also undermines the very idea of linking a modern aerial measurement with historic ice core measurements and drawing the conclusions that if things go up suddenly, this has never happened before and therefore that someone has done it. No, the CO2 measurements are long term averages and would not pick up this sort of sharp rise or fall. Then again, real scientists are not supposed to be able to voice opinions as they are not ‘climate scientists’. I cannot follow the distinction. What part of mathematics, physics, chemistry, engineering or computer modelling is unique to ‘climate science’. How did Pauchari, Gore and Flannery get to be the spokesmen? None have any qualifications in the core disciplines of science let alone the scientific method. I take it that in this post you were outlining the actual scientific knowledge of the climate of Pachauri, Gore and Flannery. that would put civilisation back in the last ice age. most likely portrayed in the graph above made a real mess. Then we started over, better luck this time maybe. Tasmania was cut off from the mainland and the Willandra lakes in western NSW dried-up, because it was fed by glacial melt. So the Mungo people would have relocated at that time, and it was dislocating for the people in SW West Oz when huge trees took the place of grasses. I don’t know if the YD temporarily reversed the process that was taking place. He details North Sea storms from the late thirteenth century onwards, which gobbled coastline, flooded far inland with storm surge and killed thousands. One, 1287, sent the sea smashing through the sand dunes and barrier islands of the north-eastern coast of the Netherlands, in a great flood, tearing out what became the Zuider Zee, and killing tens of thousands of people. (Wikipedia puts the death toll between 50,000 to 80,000) That storm was fairly early in the cooling from the Medieval Warming. The Wolf Minimum may also explain the ’1300 Event’ in the Pacific. Elaborating on my earlier comment. I’d hardly call a bit of drifting around the polar latitudes , as it has bedn for years, ‘inverting’ . What has magnetism to do with weather ? Well the inflow of Cosmic particles of course follows the the lines of flux , entering st the poles, but who understands that in terms of weather. Piers Corbyn perhaps, but your Catastrophic Zclkmate crowd. One BIG problem for those wishing to find something in ice cores – Some US WW2 aircraft were found at about 250 feet down in the ice after being abandoned during the war,this was after 50 years. So if that much ice could be laid down in that time frame then any calculations would have to be considered as problematic. This book was written by Professor Rachel Carson in 1953, The sea around us, In depth real science on how the oceans tides affect climate, tides being affected by moon and sun they run on an 1800 year cycle of cooling and warming, A beautifuly written book from a real scientist, rather than a leftard in a labcoat. There are always answers in science, politics and history which are clear, concise, simple ….and wrong. It takes a long time to sort them out. Ice cores are so useful. Sarc. The detail claimed seems unlikely. If such detail is plausible, where is the ice-core to modern days? Also what will an ice-core tell you about years where the annual snowfall does not survive? We know, according to the geologists, that over 3 miles of ice cap melted here in northern Canada, approximately 1 mile of ice at New York area. We claim from glacial runoff sediment in isolated arctic lakes, that some years in the 12-1300s had estimated annual temperatures of 6C, todays average being -0.6C. We are also told a glacial lake formed, covering most of the NWT Canada, during the retreat of the ice caps, until an ice dam plugging what is now the Mackenzie basin let go, flooding millions of tons of fresh water into the Arctic Ocean. Where is the proxy record of this “catastrophe”? Yet we are to be stampeded out of our freedoms and property by a claimed temperature change, smaller than the instrument error of our records? I am with Roy Spencer, no quarter. These sleezy tools and their useful fools, attacked me, you and every freeperson on this planet. To prevent a rerun of history, we need to stop these eco-nasties seizing power. The parallels with the irrational enthusiasm of the eco-nazis are stark, frightened people scammed into surrendering good judgement and power, into the hands of self certain saviours. Zealots, bandits and maniacs, all know no limits to their grasp. The United Nations is done, fully exposed as a means of robbing the many, to enrich the few. As the prolonger of misery, in every conflict it touches. As a cesspool of the most useless, power hungry nitwits ever collected together in one spot. As the coordinating body of the Climate Catastrophe Commissioners, let us treat them as they demand we who doubt must be treated. No quarter indeed, as I feel assaulted, insulted and have certainly been robbed by the sheer wastage of my tax dollars and inflated energy costs, I say let us give these emotional basket cases, these chicken little thugs, the reward they wished upon us. Banishment to an Arctic Paradise where they can enjoy a “carbon free” lifestyle as they bask in their imaginary global warming. We are currently over run with fools and bandits, all in positions of trust, living large upon the stolen property of other people. Something is strange with the numbering of comments here, 36 was started after reading 38. The other issue of weather cycles causing more or less storms, has intrigued me for years, when the Spanish treasure fleets where caught in hurricane after hurricane, during a period of cooling, where are those hurricanes today? Do the Royal Navy records, show any evidence of the claims of more frequent storms and increased intensity of trade winds? Funny how the data still has not become publicly available, yet these would have to be the most comprehensive records available of wind and weather. The Empire controlled the globe, with sailing vessels, yet no money appears to have been spent to see what the navy recorded of our past. Is it possible that the data conflicts with the cause? Or that this information is undesirable as empirical data always seems to contradict the wishful delusion of the model makers? more desperate by the day? He cited the possibility of how flooding in Pakistan could destabilize that country, a nuclear power, and the possible effect that continuing drought in California might have on the world’s food supply. Among the countries or states turning to renewable energy strategies, Gore mentioned the Vatican’s increasing use of solar technology. Vatican City, Gore said, wants to be the first CO2-neutral sovereign city-state in the world. Gore conceded the possible fatigue some may have with his warnings, as well as the possible sense of powerlessness as to what any one individual can do to affect what appear to be vast, unchangeable trends. “Do we really have to do this and — if the answer is yes — can we do it?” Gore said, repeating two questions he routinely hears. And just what had the original Dust bowl to do with raised CO2 levels. These fools have to really ask themselves if they have any coherent thoughts at all. “All panel members have completed private interests declarations, as is required to identify potential conflicts of interest,” Mr Hunt said. However, one of the four panellists, Shirley In’t Veld, who now sits on the CSIRO board and was formerly head of WA’s Verve Energy, said she had not been asked to make such a disclosure. Chair: So our best chance to lower the emissions intensity would be to have better technology to clean up, for want of a better word, coal fired power stations, because we have to continue to rely on coal? In’t Veld: That is right, yes. Chair: In the context of this debate there is a lot of talk about renewable energy coming onstream, like wind powered stations, solar and a range of others. That is not going to be able to fill the breach? surely there is at least one radio host in WA who could put you on between now and the election to explain to the public what the carbon tax/ret would cost them in the near, medium & long-term. in fact, you should be a regular guest. THE Greens will seek to block the cancelled auction of carbon units to polluters, which the Abbott government says will add millions to household bills and cause business uncertainty. The two parties could combine to disallow Mr Hunt’s ministerial determination. “Only (Labor leader) Bill Shorten can reinstate these carbon tax auctions,” he said. Environment Minister Greg Hunt will block the Clean Energy Regulator from selling any more credits to businesses, which was to be conducted before June this year. In an unexpected move that will take Labor and the Greens by surprise, a regulation signed secretly last week will be tabled in both houses of parliament this morning. In a futher ramping up of pressure on Labor on the issue, the consumer watchdog has been directed by the government to begin an economy-wide monitoring of prices since the carbon tax was introduced. The move to scrap the levy comes as it was revealed families face an increase on their electricity bills of about $24 a month — after it is supposed to have been axed. It appears unlikely power prices will fall from July due to a little-known clause in wholesale electricity contracts — and the greed of power retailers. Most of the deals between the electricity generators and retailers contain a “carbon benchmark addendum”. The brokers, banks and other members of the Australian Financial Markets Association (AFMA) that determine the terms of the addendum are likely to increase the carbon rate by 5 per cent until repeal, when it will fall to zero. “But I do not expect them to vote for a retrospective adjustment,” leading energy lawyer Fiona Melville said. And they have no intention of being generous. News Corp asked leading retailers AGL, EnergyAustralia and Origin whether customers would pay carbon tax after July 1. None could guarantee that their customers would be spared the ‘price on pollution’. Most analysts said removing the carbon tax would trigger a price fall of 7.5-9 per cent, with the exact figure dependent on the cost of the wholesale electricity in that geographic area. The analysts noted that other costs such as network expenses could go up, meaning the actual drop customers see in their bills may be smaller. Q: And Fiona the international price seems to be quite low; do you expect that many entities will be trying to take advantage of the international prices? Now companies who are liable under the Carbon Pricing mechanism are running out of time to report their interim emissions number and also surrender eligible emissions and joining us to provide some last minute tips is Fiona Melville, who is a Partner at K&L Gates. not a lot of attribution on these stories, News Ltd? GreenCollar Group will issue the first ever Australian Carbon Credit Units (ACCUS) for a Native Forest Protection project on a Western Lands lease. The ACCUs generated from these projects will be sold to companies with liabilities under the Carbon Pricing Mechanism as well as the government’s new Emission Reduction Fund. “Approval for our latest and first of a kind project comes just weeks after we were issued the first ever Australian carbon credit units for the first native forestry protection project under the CFI, the Horse Ridges Native Forest project,” Schultz said. Not specifically related to the story at hand but global warming related and very frightening as well………. Now “warmists” dream of STABBING those who don’t buy their lies ! Australian Antarctic Division director Dr Tony Fleming said the rescue cost his division around $1.8 million and they were trying to recoup the bill. “We’re having discussions with the insurance companies,” he told a Senate estimates hearing in Canberra on Monday. Take a look at the first graph again. Note the abrupt shift into the YD (which everyone picks up on) and is blamed by some as a comet storm (think of thousands upon thousands of Tungiska-sized blasts over the period of several hours) over North America. Well if this work shows nothing else, it clearly puts paid to the utterly false argument that recent changes are happening at an unprecedented rate. I always knew that was total BS. Why did they find mammoth bones on ocean floor between England and France ? Was it once dry or did the seafaring peoples throw bones overboard after dinner ?